When I discovered natural vision improvement nearly 20 years ago, and realized it was possible for me to improve and maybe eliminate my lifelong strong myopia, I was thrilled. Thick “coke-bottle” eyeglasses, then thick hard contact lenses, had been a big part of my life since I was 5 years old, central to who I was. Could I really let go of my Nancy Nearsighted identity? Well, I had nothing to lose but my “eye cages”, so I dove in. I read all the books I could find on vision improvement, some of them 2 or 3 times, trying to absorb every speck of wisdom. I was also hoping I would find the seemingly well-hidden secret to having perfect eyesight. When I read about palming and swinging and the eye chart and sunning, I practiced all of them, obsessively. I was fiercely determined to improve my blurry vision. With this end-gaining approach (which Aldous Huxley warns against in his classic “The Art Of Seeing”), I made very slow progress. I often gave myself a headache (a sure sign of strain! ), and sometimes ended up in tears when I tested my vision using one of my many eye charts, and it didn’t seem to be getting any clearer. What was I doing wrong? Why did everyone else I read about seem to have no problem shedding diopter after diopter, when it was so difficult for me? I was used to being a top student, and had thought I knew how to learn, but I sensed I was missing something here. Pushing at my limits is how I’ll grow, I’ve always known. The chick has to push and peck its way out of the egg, and the butterfly has to push against the chrysalis to emerge. Everything else I had wanted to accomplish meant I had needed to push myself and work hard to reach my goal, whether it be an academic degree or one more chin-up in the gym. (I did the most chin-ups in my 6th grade class, boys included, I’m guessing partly because I only weighed 60 pounds back then.) 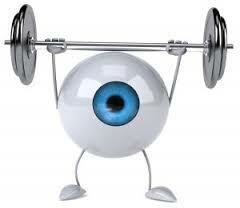 But pushing to improve my vision, I found, could often be counter-productive. Dr. Bates, the vision improvement pioneer who lived over 100 years ago, wrote that most if not all vision difficulties are from strain, straining to see, or sometimes straining not to see. Resistance is straining, and so is pushing! The light was slowly starting to dawn — I was pushing too hard! When I shifted my focus from pushing myself to see, to allowing myself to see, I finally began to notice steady improvement. It’s much more my nature to push myself than to be gentle with myself, so this is still a dance I’m learning. 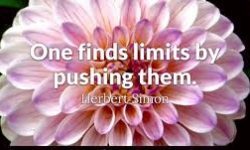 Yes, I do want to push my limits, but not to attack them! Easy does it, like the bumper sticker says. And I’m realizing that my attitude is as important, if not more important, as what I’m doing. If I’m doing something as beneficial as palming, yet I’m impatient or angry and can’t let go of that to be peaceful and settle into the blackness, it won’t help me much. No wonder I made such slow progress when I started! I was treating my visual system like a horse, beating it to make the poor creature go faster. Now when I can’t see as well as I’d like, I can usually catch myself before I get too deep into that old trying and pushing pattern, and instead start welcoming in the clear images. I’ve found I need attitude practice as much as I need eye exercises. Could this be your case too? TOO RIGHT! =D Your insights are directly on target for my circumstances, so it’s helpful to be exposed to your perspective. Your good work serves as a Wake-up Call that often appears at the right time. Thank you, Nancy, for sharing your experiences so helpful to others. Just love your stuff – plenty of insights. Don’t forget to witness “sight seeing”. Just allowing is the message i gain to day . What a wonderful set of hands-on newsletters you have in your library for all to understand. Attitude is re calibrating heart and soul setting your inner fulfilling purpose… for the others you inspire.